In the movie, La La Land, the pursuit of dreams can be a bumpy ride, but nothing like that in the pure pleasure of a classic pairing, champagne and caviar. We’re in the midst of Hollywood’s awards season, and whether you’re attending all the glitz and glam at a red carpet event, or just putting on the ritz at home while watching it live, there’s no better treat than a tin of caviar washed down with the best champagne. Whether you’re applauding the more inclusive nominations, not #SoWhite this year, or cheering on your personal favorite, the celebrations are more special with this elegant match. One of the few remaining family owned and operated Champagne houses, Taittinger has distinguished itself in many ways. Champagne Taittinger uses about 50% estate grown grapes, harvested from over 750 acres in 34 different vineyards, including some very prestigious Grand Cru vineyards in the Côtes des Blancs and Montagne de Reims regions. These sizable holdings, especially in Chardonnay vineyards, give Taittinger a high quality edge over other Champagnes. Taittinger’s signature style, elegant and fresh, comes from the larger percentage of Chardonnay used to blend their wines. In addition, the wines are often aged longer than required before release, adding to the delicacy and complexity of Taittinger’s champagnes. Champagne Taittinger has a very large portfolio of sparkling wines, from the classic Brut La Française non-vintage cuvée to the exceptional Comtes de Champagne Blanc de Blancs, a 100% Chardonnay wine produced only in the best vintages. Calvisius Caviar is one of the highest quality caviar producers in the world, producing 25 tons annually from their sturgeon farm in northern Italy. 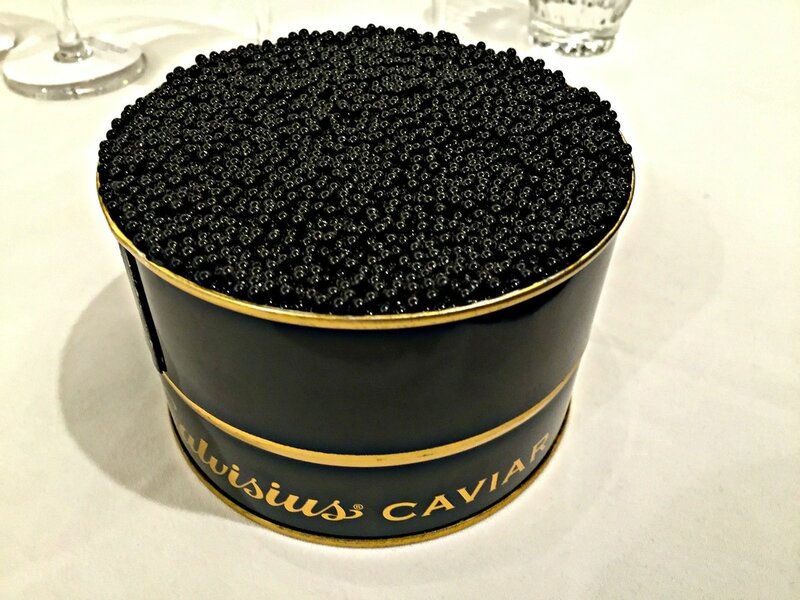 Responsible for 1 out of every 10 caviar tins sold around the globe, Calvisius was visionary in their focus on sturgeon and caviar products, jumping into the business decades ago, before wild stocks were decimated. Forty years in the making, Calvisius today raises several species of sturgeon in fresh water ponds on over 150 acres, fed by pure spring water, with no filtration systems, hormones, antibiotics, or pesticides. It’s an exercise in patience, since sturgeon must reach maturity before they have eggs, anywhere from 7-22 years of age. And it’s not just the eggs that are so precious, sturgeon meat, firm and mild, has been coveted by European royalty for centuries. Since Beluga, the world’s most famous and expensive caviar, has been banned in the US for over 10 years due to poachers and pollution wiping out the fish in its native Caspian Sea, aficionados have turned to farmed caviar. Advancements in aquaculture has vastly improved the quality and once again made it a luxury that is accessible to those who crave it. Calvisius offers several varieties of caviar in two different product lines, as well as fresh and smoked white sturgeon meat. Champagne Taittinger and Calvisius Caviar together brought an appreciation for their elegant offerings at a Los Angeles seminar, just before the 2017 SAG Awards, of which Champagne Taittinger is the official champagne. Vitalie Taittinger, the Artistic Director and Global Ambassador for the brand, accompanied by Jordane Andrieu, owner of Héritage Fine Wine in Beverly Hills and US Ambassador for Champagne Taittinger, and John Knierim, Vice President of Calvisius Caviar, spread the word, that elegant champagne and delicate caviar are a treat worth seeking out! Just like food and wine pairings, the flavor nuances and textures of caviar and champagne need to be balanced and complimented. It was an eye-opening experience, a hedonistic exercise in slowly savoring the qualities of both. Four different pairings pulled out the best, serving as a reminder of the exquisite nature of champagne and caviar. First, a tutorial in how to taste caviar, no toast points, onions, or chopped egg here, just pure unadulterated sensory pleasure. Knierim explained, “When you first taste caviar, you’re going to make a fist, take the caviar and put it on your hand. Look at the eggs, how nice and round they are, how the oils are, no broken eggs. Once it’s on your hand, you want to smell it. If it has any kind of smell to it, you don’t want to eat it because that usually means it’s spoiled, or salty, or they’ve added something to it. Good caviar should have no smell whatsoever.” So much for conventional wisdom that caviar is fishy! Knierim continued, “Put it on your tongue, crush it on the roof of your mouth, and let the flavors come to you for a second or two, then you can swallow it. You’re going to taste the different nuances which you’re going to get out of the caviar.” Holy smokes, what a revelation! Knierim noted that the ritual of serving caviar with accompaniments evolved from necessity, before refrigeration, when up to 25% salt was added to the eggs to preserve them. Calvisius’ fresh caviars have less than 4% salt, the minimum required by the EU for food safety, labelled “malossal” or low salt, and their flavor shines through. Each species has a different flavor profile, and the age of the fish affects the roe, just like fine wine, the older, the more complex. Taittinger introduced her champagnes, speaking of a family legacy of quality that has continually improved since the first vintage in 1932. “My ancestors really believed that champagne ought to be very elegant, very feminine, and very light, to be a good match with food”, Taittinger said. Her father, Pierre-Emmanuel, assisted by Vitalie and her brother Clovis, are committed to crafting the best champagne in the region. Invigorated by a brief blip, when the company was sold and bought back in 2006 by her father, Taittinger observed, “Thanks to him we are still here, still maintaining the style and quality of the champagne. It’s not a financial decision, it’s a heart decision, we want to make quality.” Sustainably farming 800 acres of wine grapes in the humid region of Champagne presents many challenges, and a certain amount of risk, not employing chemicals or pesticides to protect the vines. But Taittinger believes, “You can always find a good thing in a bad thing, and I think this fact was the reason why today Taittinger has so much vitality.” And it’s something that is reflected in the wines, using only first press juice, the fine bubbles express the extended aging, and a complexity on the nose and palate. First pairing, Champagne Taittinger Brut La Française NV, a classic blend of Chardonnay, Pinot Noir, and Pinot Meunier from 35 different vineyards, is fresh and vibrant, with an expressive bouquet of white peach, citrus, brioche, and white flowers. Aged for almost four years before release, twice the legal requirement, La Française offered a perfect counterpoint to the Calvisius Tradition Prestige Caviar. Prestige comes from the North American white sturgeon species, imported to Calvisius’ Italian aqua farm decades ago, raised from start to finish onsite, what Knierim called “The American with the Italian accent”. He explained, “ This is the one I use to introduce anyone to caviar, it’s so buttery and creamy, so mild.” As a cornerstone of Calvisius’ original plunge into sturgeon and caviar production, UC Davis sent them six of these fish in the late 1970’s. Producing eggs at 12-15 years old, they can live to 100, reaching 2,000 pounds and 20 feet long. One of the original six sturgeon, a hefty 1,700 pounds and 17 foot long female, still lives at the farm, enjoying life as part of their permanent aquarium, a tribute to Calvisius’ humble beginnings. Third pairing, Champagne Taittinger Comtes de Champagne Blanc de Blancs 2006, 100% Chardonnay, is smooth and lively, with a complex bouquet of tangerine, white peach, and pastry notes, evolving into grapefruit and a hint of licorice in the mouth. This exceptional champagne is only produced in the best years, from the top Chardonnay Côtes des Blancs vineyards, the ultimate expression of Taittinger’s house style. A small percent of the wine is aged briefly in French oak barrels, while the final blend is aged for 10 years on the lees, giving it texture and intrigue. Taittinger noted, “ It’s a wine that is the best of the best, the best Chardonnay you can find in Champagne, from five villages, all Grands Crus, aging 10 years, made in a small quantity. This wine is a jewel to us.” She stated that 2006 was a fantastic harvest, a warm year that yielded very high quality grapes, and has special significance to her family since it was the year that they regained control of their Champagne house. Knierim paired the Calvisius Siberian Caviar with the Comtes, saying “it’s very creamy, buttery, it’s the strongest flavor but you’re going to get an almond finish, and that pairs so well with this champagne, it comes to life.” Siberian caviar comes from the Baeric sturgeon, which takes 7 years to raise, and produces twice as many eggs as other species. It has become a favorite among top chefs to accent oysters, scallops, smoked salmon, tartare, and sushi. Fourth pairing, Champagne Taittinger Comtes de Champagne Rosé 2006, 70% Pinot Noir and 30% Chardonnay, is breathtaking, incredibly complex in its intense nose of wild strawberries, cherries, and black currants, with hints of almond and licorice. Splendid and stunning, this wine has a bit of heft on the palate, yet is balanced in its acidity and richness. Andrieu commented, “Only 40,000 bottles of this Comtes rosé is produced in the best years, out of 6 million total. Its intensity pairs with this more intense caviar.” Knierim brought out the big guns, pairing the Ars Italica Calvisius Oscietra Royal with it. He said, “This is probably one of the most sensual caviars, because you’re using all your senses, the texture and flavor, you’re allowing it to come to you. This particular caviar, when you taste it, you might get a little bit of a celery note right off, after that you might taste hazelnuts, walnuts, almonds, very nutty, buttery and creamy, and then at the end, if you let your tongue hold it for just a little bit, you’re going to get a fruitiness to it, I taste apples, pears, strawberries. This is like a fine red wine, it just keeps on coming at you”. Knierim encouraged everyone to savor the moment, “Don’t be so quick to swallow it, don’t be so quick to enjoy it!” Osetra, a smaller sturgeon, originally came from the Caspian Sea, and takes 11-12 years to mature. The Royal means that it’s the front 10% of the egg sac, where more fat means more flavor. The larger eggs are dark brown, with amber shades, and offer a firm texture that is velvety on the tongue. Champagne and caviar is a match made in heaven, treat yourself to a sensual symphony of luxury with the best, Taittinger and Calvisius.